Government and big media portray it as a conflict between squatters and conservationists, but it’s just as much about extraction, displacement, militarization, and narcotics. Sometimes indigenous and rural activists in Central America are targeted for being environmentalists. Other times, they are targeted in the name of environmentalism. A report from Mexico brings worrisome news: Last week, on June 2, the Guatemalan military and National Police drove 700 Guatemalans from the Petén community of Laguna Larga, a majority of them women, children, and older people, out of their homes into the Mexican state of Campeche. The objective of the eviction was to clear people off nature-reserve lands, though other interests were at play. The refugees had to work their way through the lowland jungle in the rainy season, apparently pursued by a military helicopter. In the 1980s, as the Guatemalan military executed its genocidal scorched-earth campaign, which included the destruction of hundreds of villages and the commission of over 600 massacres, more than a million Guatemalans were driven from their homes. Many escaped into the mountains and jungle lowlands, where they organized themselves into clandestine Communities of Population in Resistance. For over a decade, they eluded the military’s efforts to track them down and forcibly resettle them in strategic hamlets under army control. Many thousands fled into Mexico, into Chiapas and Campeche, some staying for decades. So news of last week’s eviction raised fears of a new “exodus” of Guatemalan refugees. In Mexico last week, the Guatemalans were provided aid by local officials and by the office of the United Nations High Commissioner for Refugees. But they were also harassed by Mexico’s immigration interdiction agency, the Instituto Nacional de Migración, which basically acts as the advance guard of the US deportation regime. The last thing Mexico’s federal government wants, as it ruthlessly captures economic migrants from Central America, is yet another humanitarian crisis similar to the 1980s one on its southern border. In the Petén, what passes for “environmentalism” often masks a toxic mix of crime, corruption, and counterinsurgency. According to Luis Solano, an investigative reporter with deep knowledge of the Petén, the refugees don’t want to be treated as refugees. They want to return to their homes. The reason the military drove them out was to execute a court ruling, which found in favor of Guatemala’s National Council of Protected Areas of Guatemala (CONAP, in Spanish) in its effort to clear the settlers out of the region’s protected nature reserve. Sounds good, right—protect nature? Except that in the Petén, what passes for “environmentalism” often masks a toxic mix of crime, corruption, and counterinsurgency (Tony Andersson is writing a terrific dissertation, “Environmentalists with Guns,” on this subject, covering the period from the 1940s up until the official end of Guatemala’s armed conflict in 1996). 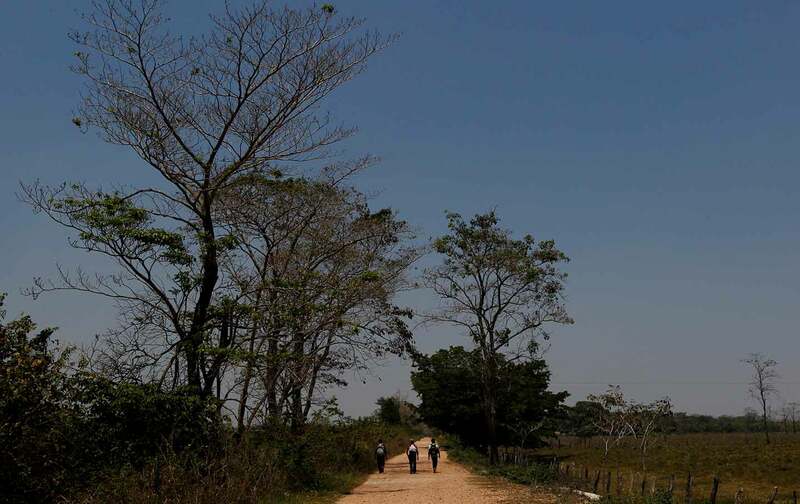 Solano says there are 37 communities located in what is known as the Parque Nacional Laguna del Tigre, locked in a fight for recognition of their rights to live and work. Although the Guatemalan government and the country’s big newspapers often portray that fight as a conflict between squatters and conservationists, the interests are much murkier. “The problem for the communities in the Parque Nacional Laguna del Tigre,” says Solano, “is that they are located on land where military, economic (oil extraction, agribusiness, including biofuel production, and tourism), and extra-economic interests (including drug trafficking, ‘narco-planters,’ and ‘narco-ranchers,’) intersect. They are subject to the corrupt political structures and narco-power that dominate the region, in collusion with the main oil company, Perenco” (for more on Perenco, see here). Added to these on-the-spot depredations, as reported by Sebastián Escalón on Guatemala’s Plaza Pública website, the Parque Nacional Laguna del Tigre management is indirectly influenced by USAID, via funding of the nongovernmental organization Sociedad para la Conservación de la Vida Silvestre (Wildlife Conservation Society, or WCS, in English). The WCS is based in the Petén, and has contracts with the Guatemalan government to administer the Parque Nacional Laguna del Tigre, along with other national parks. The WCS has the most interest in the eviction, and is deeply mistrusted by true environmental and front-line peasant organizations. The WCS seems to be a good example of how, through privatization and environmentalism, the nasty side of neoliberalism—extraction, displacement, militarization, and narcotics—gets greenwashed. Peace Brigades International, which has been doing heroic work in Guatemala for decades, has produced a number of reports that provide background on the conflict, including the long history of migration to this area (some of the settlers had been external and internal refugees from the military’s scorched-earth campaign in the 1980s; others have been displaced from elsewhere by the expansion of biofuels, livestock, or drug trafficking). Two of the PBI reports can be found here and here. Ongoing reports by PBI are periodically released, and would be a good source for readers to keep track of events. Not just in the Petén, but throughout Guatemala—as in Honduras, especially in the Aguán Valley—land conflicts and evictions related to drugs, mining, biofuels, dams, and ranching are widespread and growing increasingly violent. The assault on Laguna Larga is just the first of what is expected to be a series of expulsions. La Mestiza, another Petén community, is scheduled for eviction by the army on June 14. Journalists interested in following up on this story can contact Rachel Nolan at rachel.nolan@nyu.edu. Rachel is in Guatemala at the moment and could put you in touch with sources and organizations with more information.